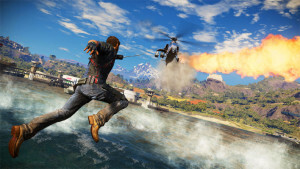 Just Cause 3 should really be called Just Do What You Want, because it’s quite the wild ride. 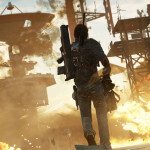 The premise of the game is that the protagonist, Rico Rodriguez, is back in his home country of Medici, a fictional Mediterranean island run by a brutal dictator. Think of an Italian version of Kim Jong Un in charge of Cyprus and trying to take over the world. Rico does many things to take down the dictator and works with many people along the way, but this isn’t really a game about the story. 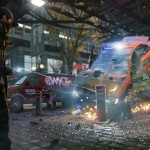 This is a game about action, insane, ridiculous action. 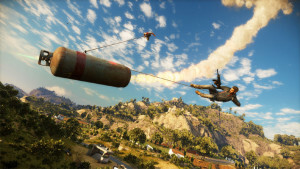 From the first moment of the game when Rico climbs out the window of a small plane to stand untethered on the roof and shoot shoulder launched missiles at various targets on the ground, there is no question what kind of game this will be. I like to think of it as Urban Action Fantasy. Newtonian physics simply do not exist for Rico. Rico lives in more of a quantum world, a world in which a grabbling hook shot into a building from a parachute somehow grants a controlled fall. Wingsuits function more like jetpacks and opening parachutes are effective at bizarrely low altitudes. This does not look too crazy right here. The delight the developers have in doing away with physics in all aspects of this game is abundantly apparent. 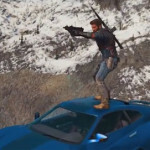 Actually, the most effective way to play Just Cause 3 is to simply free your thoughts of physical constraints and do whatever crosses your mind. I found that if I assumed everything was possible, I didn’t die very often. It becomes almost impossible not to try to complete missions in the most obscure, ridiculous fashion possible and the game rewards that behavior. It’s absurdly fun, or at least it is if you can free your mind to embrace the fantasy, which is sometimes harder than it sounds. Now this is just a bit more crazy right here. For example, in the real world shooting a large satellite dish with a handgun will result in a satellite dish full of holes, but it won’t, for instance, make it fall off a tower. 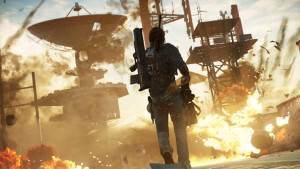 In Just Cause 3, it totally falls off the tower, so it takes a moment to figure out just how far the developers are willing to bend the rules of physics and it’s really far, even for small things like the satellite dish. We’re all used to developers letting go of physics for really big events in a game, but Avalanche decided to go all in on Just Cause 3. Now this, well, this is just insane. But it happens all the time in a game like Just Cause 3. 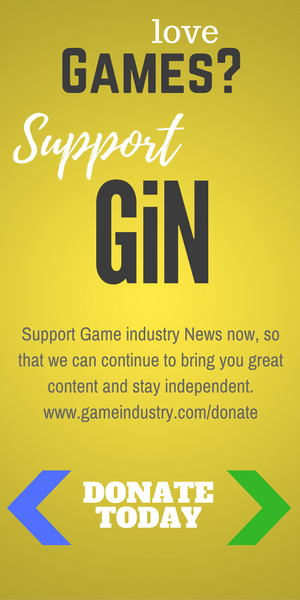 Once that’s understood, it’s much easier and much more fun to play the game, but if you’re the kind of player who can only suspend disbelief so far, this is probably not the game for you. I mean Rico Rodriguez makes Lara Croft and Nathan Drake seem absolutely rooted in reality, which is a very disturbing thought for about five seconds and then it’s just super fun. There are a lot of laugh-out-loud, no-way moments in this game. Those pistols are really powerful we guess? Rico gets to fly planes, helicopters and his wingsuit. He has a parachute that opens effectively if he gets just a few feet off the ground, and a grappling hook that also functions as a zipline, and can grapple two targets together for hilarious hijinx, or big explosions, whichever you prefer. Rico can ride on top of cars, inside of cars, or inside of tanks. He can drive all over the place, but why bother when he can fly almost anywhere with his wingsuit. He has an endless supply of C4 and can have weapon caches dropped out of the sky pretty much whenever he needs them. 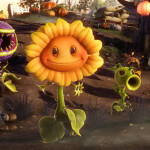 In short, it is the perfect action fantasy game. Start your crazy adventure in Just Cause 3 with a copy from Amazon right now! If that is your genre go forth and purchase. 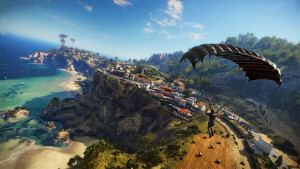 Just Cause 3 earns 5/5 GiN Gems for madcap good fun. 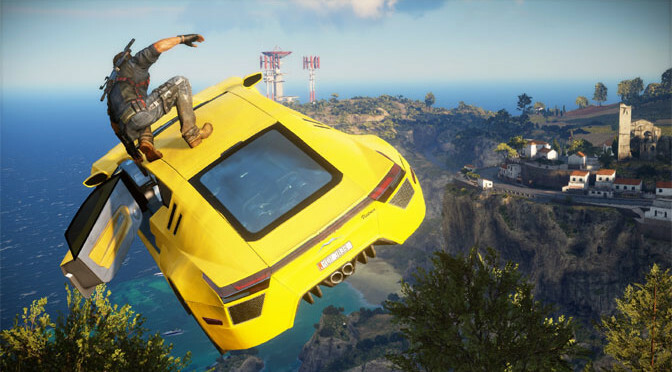 What’s the most absurd thing you’ve done in Just Cause 3? Tell us in the comments below. Note: never ever try anything Rico does in this game at home or you will die a horrible, horrible death.